A one-hour hands on period with the HomePod found sound quality beating out offerings from Google, Amazon, and Sonos, with security provisions preventing personal information from being read aloud by the HomePod when the primary user's main device isn't on the home network, preventing other users in the house from getting calendar items read or other personal notifications. Refinery29 spent an hour with Apple's HomePod. 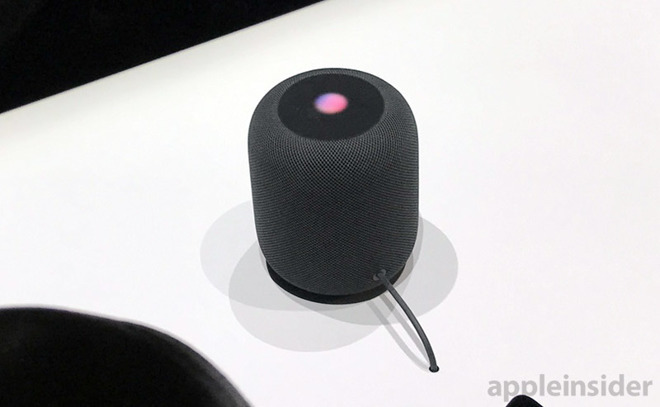 During the brief examination, the ability of the HomePod to read and send texts, plus set up reminders through Siri voice commands was examined. During the testing period, it was discovered that not only will the notifications not be read when the user's primary device isn't connected to the network, but they can be disabled in HomeKit settings to turn off the notifications entirely. Other points of interest include an improved Siri with correct pronunciation of music-related topics, and useful information about band members and albums. Additionally, the author reports that Siri sounds even better than the improved voice that debuted in iOS 11, with "only a few instances" of "awkward phrasing." The author also claims that the sound quality on the HomePod was superior to that of the Google Home Max, the latest Amazon Echo, and Sonos One —but little information was given about the test environment or the tracks listened to by the evaluator. Specifically, vocals were "consistently crisper and clearer" on the HomePod, with a "robust thump-thump" from bass notes as one would desire. Apple's $349 HomePod was revealed at the 2017 WWDC with pre-orders starting on Friday, with shipments commencing on Feb. 9. The HomePod is powered by an Apple A8 chip featuring realtime acoustic modeling, audio beam-forming, and multi-channel echo cancelation. It also features a subset of Siri, optimized for music consumption.